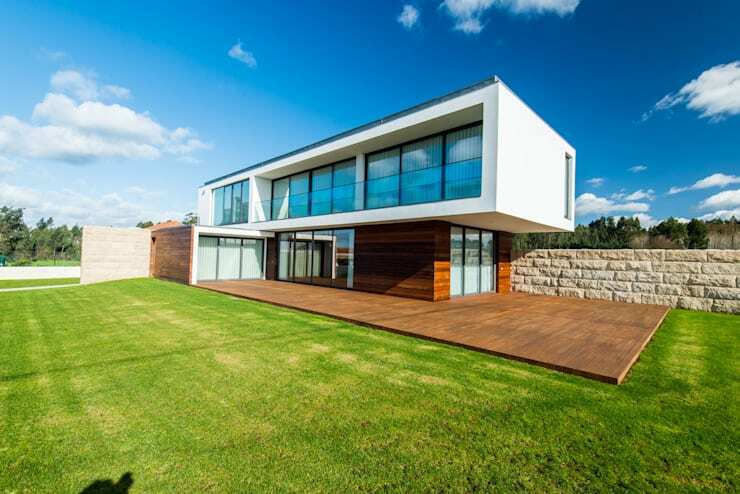 From the collection of houses here on homify 360°, we are presented with a variety of different emotions. Some make us feel nostalgic, some warm and fuzzy, while others, let’s face it, leave us with a lime green feeling of jealousy. And then there are those that render us quite speechless. This example is certainly one of them. Modern volumes, together with an innovative approach and sophisticated finishes, make up the splendid beauty we are viewing today. It is the creation of architectural geniuses a3+, located in Porto, Portugal. More than just a bunch of architects working on drawings, a3+ approaches projects from a multitude of angles, including design/remodelling, home staging, consulting, events and communication. By working with various types of programs, these professionals propose a modern, contemporary look for their projects, and always adapt their creations to suit the clients’ needs. Let’s meet up with this modern beauty of theirs. The facade is made up of a collection of not only unique forms and shapes, but also distinct materials. The three main stars here are stone, wood and glass, and they overlap and intertwine strikingly to exhibit this attractive facade. Warm wood make up an L-shape platform to structure the higher volume, which offsets beautifully with its mix of lightness and transparencies. And we can’t miss the gorgeousness that comes from combining these neutral colours with that ocean blue sky and lush green lawn, making this the perfect facade! Viewing the house from another angle gives us more info on its layout. 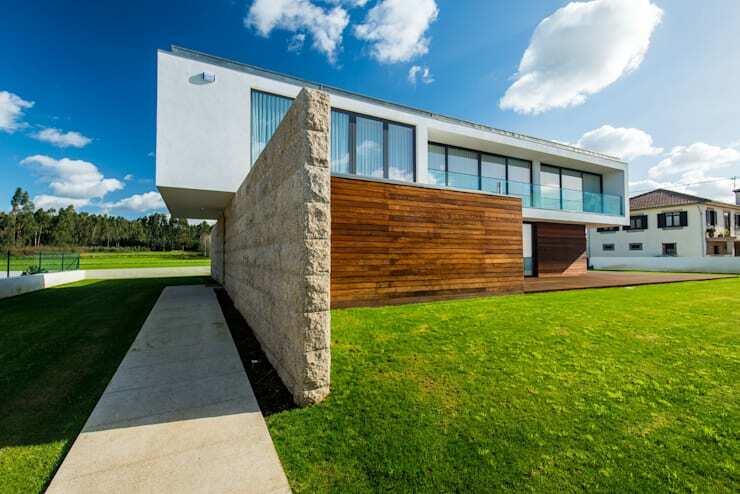 Decidedly modern, the structure makes use of simple shapes to define its volumes. It shows off a minimal use of textures and avoids excessive usage of decorations and accessories. With its clean linear design, its two contrasting volumes present a harmonious and eye-catching end result. And what beautiful house would be complete without a stunning garden? That wide lawn plays beautifully together with the wooden deck, both eloquently portraying exterior spaces that are unique for social entertaining. Take a look at these homify-approved: 7 Stunners To Boost Your Garden. And just when we thought we had this house figured out, we get thrown a contemporary curveball. 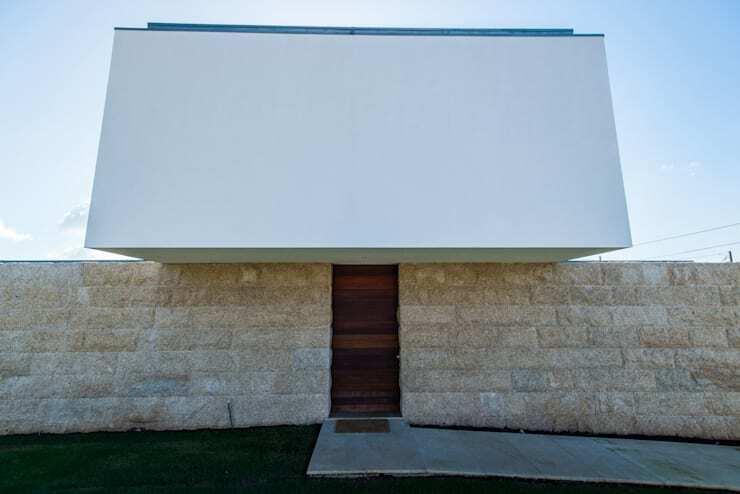 We expected a wide, open main entrance visible from afar; yet it is a simple (almost secret) wooden door serving as the entryway that was placed in the stone wall. 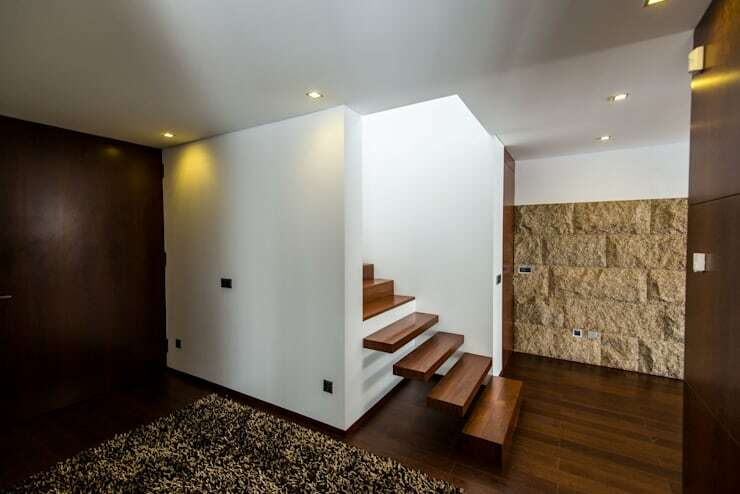 Notice the subtle horizontal lines on the stone wall and wooden door – similar, yet contrasting because of the materials. Time to take a look at those interior sections. Entering the house, we see it’s open, clean, and quite minimalistic. Some would call it bare; we call it sophisticated. Less is more, after all. 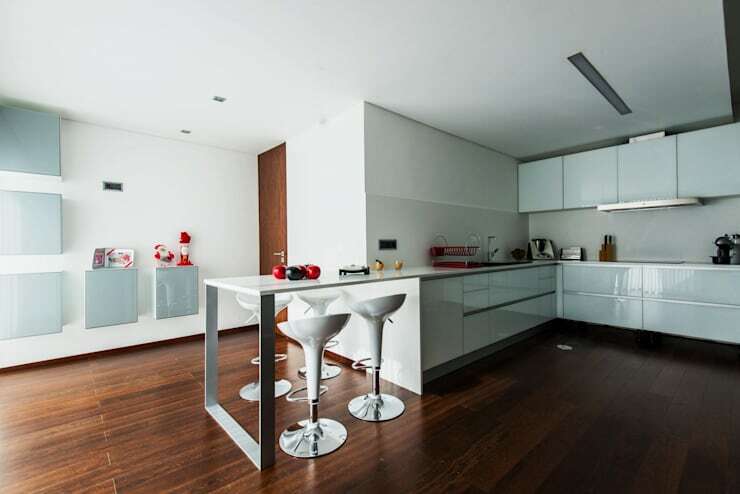 We locate the kitchen, where the dark wooden floor contrasts deliciously with the white wall, ceiling and appliances. Spits and spots of warm red break up the neutral palette, allowing for a culinary environment that is clean and serene, yet warm and welcome at the same time. Every element here has a starring role, but special notice needs to be given to those floating stairs. The first four steps, coated in a warm wood, magically hover above the ground, yet transform into a dense staircase from the fifth step to transport us to above. Downlighters in the ceiling cast down a golden tone on the interior spaces, illuminating the dark browns that seem to be taking over the floors and walls. It’s like a quiet clash between light and dark, yet it’s up to our personal tastes to determine the winner. Seeing wood in a bathroom is quite common these days. A few years ago it was unthinkable to add this material into a space meant for becoming wet and damp. Today, numerous varnishes and finishes allow us to pick and choose the type of wood that we’d love to adorn our bathrooms. As seen in the aforementioned spaces, wood make up the sophisticated flooring space. Here it continues to work beautifully with the contrasting paleness that is the bathroom area. Transparent glass for the shower, gleaming white porcelain, pristine and serene surfaces… they all add to the style of this modern space. Just notice the mirrors that take up the entire length of one wall, adding to the visual space and allowing for a reflection of natural light streaming in through the window.